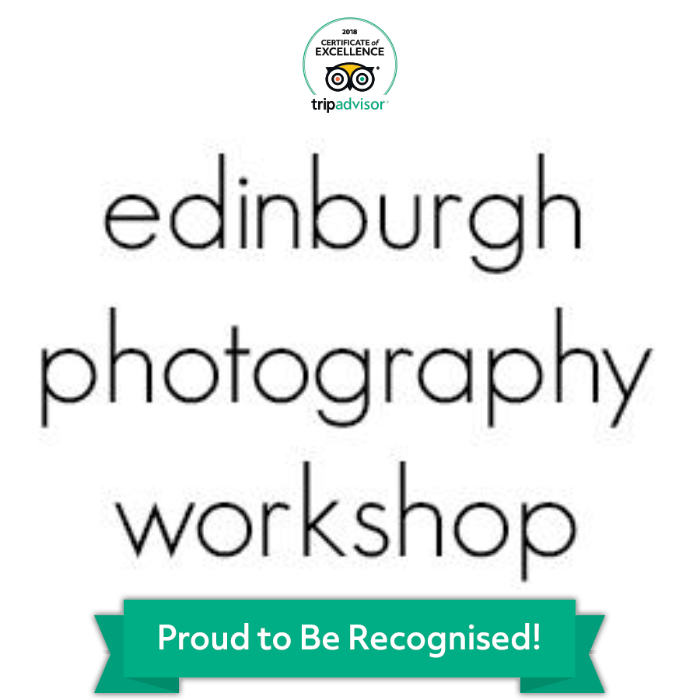 Edinburgh Photography Workshop is very proud to share that we have been awarded a TripAdvisor Certificate of Excellence for 2018. This is an award given by the leading travel site to recognise businesses that are excelling in providing services to guests. If you have attended one of our workshops and left a review, then thank you. Your wonderful comments have been instrumental in this recognition. If you have the time, you can read the reviews here. Rich is a fantastic teacher and we were able to learn about the basics to help us start using our camera to its potential. We had a great day and the follow up from Rich with learning tips has been much appreciated. We highly recommend this workshop for anyone looking to take their photography to the next level. We are really keen that we retain this award year after year. If you have any suggestions as to how we can be even better next year then we would love to hear them on our contact page. As well as partnering with TripAdvisor we have two new partnerships about to be launched. VisitScotland has recently relaunched its Tours website and Edinburgh Photography Workshop has been invited to be included in the listings. This is a great opportunity for visitors, both International and the UK, to find out about our workshops. We will also be offering a private tour service to allow visiting photographers to have a tailored package created for them. We already have three private tours booked before the launch. If you would like more information, then drop us a mail via the contact page. Finally, the international travel website Airbnb is launching its experiences in Edinburgh. Airbnb is known for giving travellers an alternative to traditional hotel accommodation. Now it is inviting independent businesses an opportunity to market to this vibrant community of travellers. Edinburgh Photography Workshop will be offering the popular Switch to Manual workshop through the site. We are always the proudest when we receive requests from customers for workshops through word of mouth. We have helped over 300 customers to become better photographers and we’d love to help more.